Rotator cuff injuries can be a life-limiting injury. Because of the pain associated with the condition and the amount of time needed to heal from it, it can restrict movement to where even normal day to day activities are hard to accomplish. As a shoulder injury, rotator cuff physical therapy can speed up recovery and allow you more mobility. Tears and impingements are the injuries most commonly associated with rotator cuff injuries. Cuff tear occurs when a muscle or tendon in the area is torn. Most do not require surgical measures, but that depends on the thickness or depth of the tear. Impingement occurs when the cuff muscle becomes inflamed and swollen, causing it to be cramped in between the shoulder and arm bones and it becomes pinched. If you injure your rotator cuff, the first step to recovery is the immediate use of the "RICE" method. "RICE" stands for rest, ice, compression and elevation, which works to quickly reduce inflammation, swelling and pain. Once these are under control and the movement is less restricted by pain, you can begin physical therapy to help the healing process. One way to thwart the development of a condition called frozen shoulder is to use the pendulum stretch. It allows you to stretch the area and keep the muscles from getting so tight it restricts movement. First, relax the muscles in your shoulder area. Whether sitting or standing, keep your arm close to you and vertical to your body. Let your arm swing slowly in a back and forth motion. Switch to side to side and then move to small circular motions. If more than minimal discomfort or pain occurs, stop the exercise. You can perform this stretch exercise for three days to everyday of the week. Slowly add a little bit of weight, such as 1 or 2 pounds and increase your circular movement from less than 1 foot to up to 2 feet in diameter. 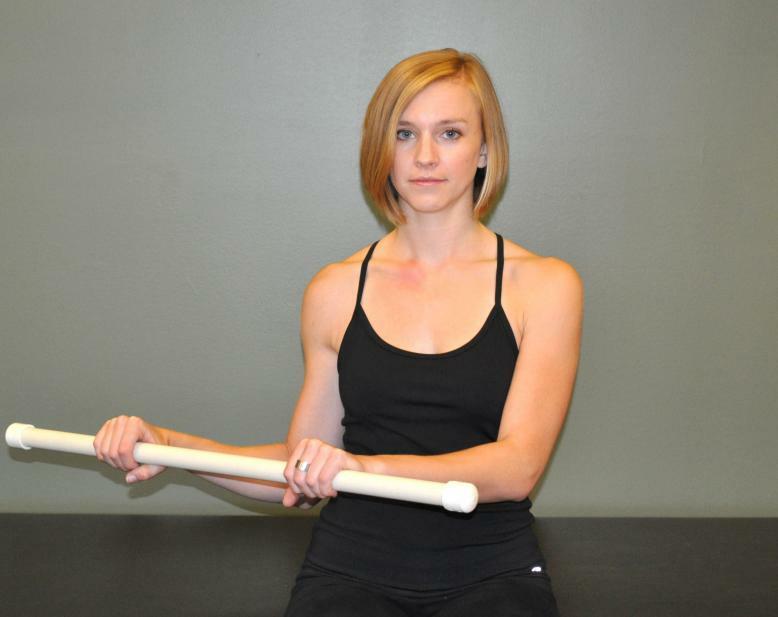 The wand exercise is designed to help you fully extend your arm at a 90-degree angle from your shoulder. A long rod or broomstick is needed. Hold the rod end with the injured side hand and the middle of rod with other hand. Use the uninjured side as the guide of the rod. The injured side should be extended from your body until it is at shoulder height if your pain allows. It should be kept straight the whole time. 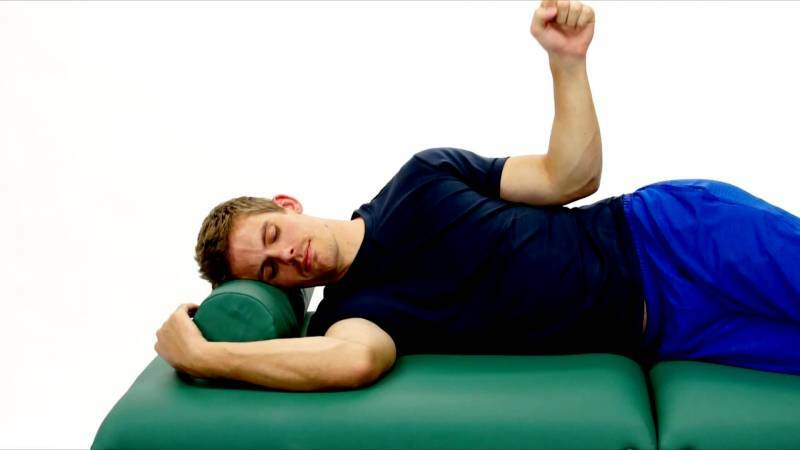 Lower the injured arm slowly until it lays next to your body. Rest as necessary. Try to repeat this action up to 20 times per day. If you can tolerate it, you can eventually move the rod to guide the injured arm slightly behind your back, but only if it does not cause any pain. Lie on your back with your elbows touching the ground and hands at shoulder wide. Hold the rod against your stomach with hands in this position. Lift your arms while keeping your elbows straight until you reach shoulder height. Squeeze your shoulder blade together and down. Move the rod back to the original position and repeat up to 10 times for one set. As you gain more movement, you can add another set. Do not do this until you pain subsides. Start lying on the floor with your back to the ground, feet flat and bent knees. Hold your arms straight about ½ foot from your sides. Place your palms upward and as you squeeze your shoulder blades, make sure your lower back stays flat to the floor. You should move your shoulder blades to each other, in a downward movement. Do not tense up your neck. You know you are doing it right if you feel the muscles contracting in between your blades. Hold the squeeze for a few seconds. Repeat up to 15 times, increasing to up to 3 times a day. You can make this rotator cuff physical therapy exercise more difficult by doing it while sitting instead of lying down. Hold a rod or tube in both hands and pull them apart when you complete the squeezing motion. Hold yourself up on all fours. Keep your back flat with your elbows straight and your palms to the ground. Keep the position as you move the hand of your injured side to the elbow on the opposite side. Hold in place for up to eight seconds. Return to its original position. Rest for up to five seconds. Repeat action again for up to eight reps. You will be able to feel the stretch in your other arm as well. If the exercise is too difficult initially, you can shift some of the weight from your arms to your legs by tilting back slightly. Position your elbows so they are close to the side of your body at 90-degrees. A good way to stay in position is to squeeze a towel between your elbow and your body. With the end of a rubber or resistance band in each hand, rotate the injured side forearm in an outward motion of three inches. Hold this position for five second, repeating up to 15 times. Hold your shoulder blades in the squeezed back and down position while doing this exercise. The doorway stretch can help loosen your rotator cuff muscles without causing further injury if done correctly. Stand in a doorway, with your arms out to your sides. Hold onto the sides of the open doorway with each hand, keeping them at shoulder height or lower if needed. Lean forward until you feel a slight stretch. Keep your back straight as you shift your weight. The stretch should be felt in your front shoulder area. Do not overextend to avoid further injury. This exercise helps reinstitute your range of motion. Start by lying down on the uninjured side of your body. Resting the elbow of the injured arm on your body, lift from the elbow up facing the ceiling at a 90-degree angle. You can rest your forearm across your stomach. If you can, lift a light dumbbell with your elbow from your side upward to the ceiling. If you feel a strain, stop. Hold this position for a few seconds if possible. If you cannot use a weight initially, do it without one. Build up to three sets of 10 reps. Repeat 2 or 3 times a day. Move reps up to 20 when 10 is easily obtained. This rotator cuff physical therapy exercise is designed to stretch and strengthen the injured shoulder area. Begin by attaching a resistance band above shoulder height to a door. It needs to be secure so it will not come off when pulled. Put the knee of the injured arm to the ground, with the opposite raised. Align your body with the knee to the floor. Your hand on the uninjured side can rest on the knee that is raised. Hold the resistance band with your injured arm and pull it while moving your elbow straight back to your body. Your back should remain straight with shoulder blades pulled together. Do not twist or turn during the exercise. Eventually, complete 10 reps up to 3 times as directed. The reverse fly helps strengthen your rotator cuff muscles while gaining range of motion. With knees bent slightly, stand with your feet apart the width of your shoulders. While bending slightly forward from the waist, keep a straight back. Hold a light weight in each hand, raise them from your body with unlocked elbows. Make sure to squeeze in your shoulder blades as you move them to complete the movement. Take care to avoid raising your arms higher than shoulder height. Build up to 3 sets of 10 repetitions. The lawn mower pull is an effective exercise in rotator cuff injury recovery, but take note to use caution or you can cause more damage than good. Start in the standing position with your feet apart the width of your shoulders. Hold the end of a resistance band in the injured side hand with the other end under your opposite side foot. The band will go across your body diagonally if you are doing it correctly. Bend forward at your waist slightly, with your uninjured side hand placed on your hip. You want the hand with band parallel to the other side and knee. Keep knees unlocked. Using a lawn mower pulling motion, slowly straighten upward as you pull your injured side hand and elbow across the front of your body while holding the band until you reach the outer edge of your ribs. Your shoulder blades should squeeze together as you straighten, but do not tense your shoulders. Eventually, work up to 10 repetitions for 3 sets.